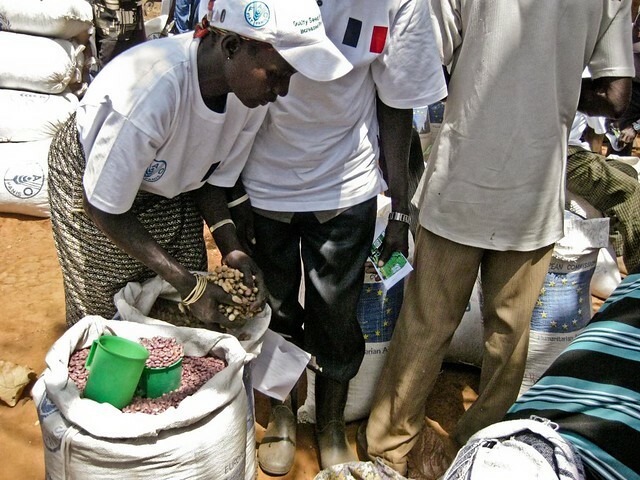 FAO is stepping up its efforts to transform agriculture in South Sudan in 2012, boosting the number of seed fairs organized before the rainy season, expected to begin in April. There are at least 13 seed fairs, during its third year of the initiative, funded by a 500 000 euro grant from the French government. In 2011, there were just eight. The first in 2012 took place in Morobo county, in Central Equatoria state, on the southernmost tip of South Sudan. In a red dirt clearing under shady trees, the seed sellers of Morobo county begin to arrive for the fair. They bring the seeds they’ve just harvested on motorcycles, tractors, even on their heads. Some have been travelling two days to make it to the event. The seed fair has its roots in a project managed by FAO, in partnership with the Equatoria Farmers Extension Advisory Association, or ‘EFEAA’. Sixty growers were given improved variety seeds before the rainy season last year and were helped to make them multiply. From her plot – just one feddan, or around 4200 square meters in size – Winnie Athyrus multiplied her initial grant by fifty. There’s more than sekedo - a drought-resistant version of sorghum - here. Other farmers have brought sacks of groundnuts, maize, cassava and beans. EFEAA Director Clement Metaloro says it’s quite an achievement. Though the rains are plentiful and the soil fertile, it’s not easy in Morobo county. Like many of the rural areas in South Sudan, there are few paved roads, even less credit, and often, only manpower drives the process. At the fair, there’s a real air of celebration at a job well done. There are speeches and even a seed play. Then the serious business begins. There’s no lack of buyers for seeds in South Sudan, but there’s a shortage of money. At the fair, poorer farmers have been issued with vouchers with which to buy the seeds. The sellers exchange these vouchers later for cash. Those queuing for the vouchers wear on their faces the struggle of South Sudan. Among them are returnees; farmers whose crops have failed; widows and children - all hoping to chase hunger far from their doors. Now they have a chance. Deputy Emergency Coordinator Michael Oyat says the fairs are the FAO’s way of stimulating seed production and marketing in South Sudan. At the end of the day, around 1 metric tons of maize, 4 of groundnuts, 1 and half of beans and more than half a metric ton of sorghum are sold. The beneficiaries go home with seeds, it’s hoped they too will plant. And though this French-funded project finishes soon, the growers say they’re determined to keep up the work they’ve begun.